1978, Starring William Smith, Micheline Lanctot, Henry Beckman. Directed by Paul Lynch. 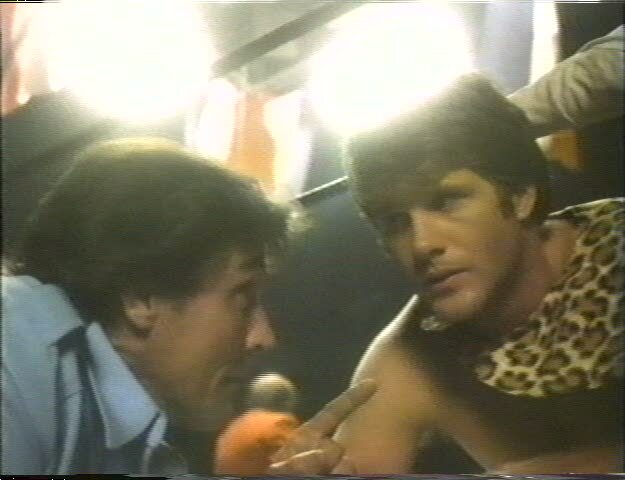 Only a year before he starred in David Cronenberg's Fast Company (1979), veteran character actor William Smith took his first Canadian job in this interesting little obscurity. The second film by director Paul Lynch, Blood & Guts is the last Canadian "loser" film of the 1970s, a fitting cap on a distinctly Canadian subgenre that was swallowed in the wake of the government-funded genre film explosion. Appropriately, it builds on the dramatic themes of Lynch's debut The Hard Part Begins (1974), while edging closer to the exploitation style Lynch would fully adopt with his next film, Prom Night (1980). Smith is well cast in Blood & Guts as broken-down alcoholic wrestler Danny O'Neil. A once-popular athlete, Dan now finds himself counting down the days to his retirement as " Dandy Dan, the Wild Irish Rose," a muscle-kissing narcissist in a blond wig. Although fading fast, Dandy Dan is still the star of the small itinerant troupe, headlining dark and dingy basements on the small-town circuit. Despite the barfights, Dan's persistently sore arm and a lack of money, Dan, his girlfriend/busdriver Lucky, some midgets, and another wrestler named Vince maintain a dysfunctional family dynamic under the patriarchal eye of the good-hearted owner and promoter, Red. During the film's first match, a spectator is brought into the ring to wrestle Dandy Dan for a $100 prize. Dan defeats him handily, but Red feels the young handsome challenger, Jim Davenport, shows promise. Afterwards, Jim accepts an offer to join their meagre outfit, and with Dan as his mentor begins to learn not just how to wrestle, but the professional courtesies of this select fraternity. Searching for a larger-than-life personality, Jim makes appearances in the ring as "The Fighting Physician" and "The Flying Frenchman" (from Quebec) before settling into "Jungle Boy", a loinclothed hero to challenge the Wild Irish Rose on a nightly basis. Jungle Boy is a hit with audiences, and when another promoter tries unsuccessfully to buy out his contract, Jim begins to learn the various hardships of his adopted family. Dan explains that the rival promoter is Jake McCann, a former wrestler who has a lock on all the big concessions. Years ago, Dan pinned him in a predetermined match-up that was supposed to end in a draw, and ever since, McCann has been exacting his revenge professionally by refusing Red and his boys access to larger venues and audiences. Jim's star continues to rise when he receives a front-page profile in a wrestling trade paper, but Dan sinks deeper into drink and self-pity. Lucky is suddenly confronted by her sleazy ex-husband who shows up to beg her to leave Dan and the troupe. Worse, Dan returns from drinking one night to find Jim sleeping with Lucky, which Dan considers a violation both of their friendship and of the wrestler's code of ethics. In the next match, Dan doesn't hold back on Jim, and dishes out a brutal beating. But Jim's punishment is cut short when Lucky's ex shows up, gunning for Dan. After taking aim with his pistol, an audience member jostles the gunman's arm, and the bullet hits Jim's ankle instead. The shooting brings the group a flood of publicity that pushes Jim even further into the public eye. Once more McCann returns to buy out Red's whole outfit, with the intention of firing everyone but Jim. Red still refuses, and McCann reacts by sending out some hired muscle to put Red and Lucky in the hospital. At least they have company Dan's there for a recent attack of angina that has permanently ended his wrestling career. Jim is livid when he learns about McCann's business negotiation methods. He confronts the unscrupulous promoter and makes a deal to fight a wrestler of McCann's choosing in a feature bout at a major venue. If Jim wins, the night's purse goes to Red, but if he loses, Mccann gets Jungle Boy's contract. 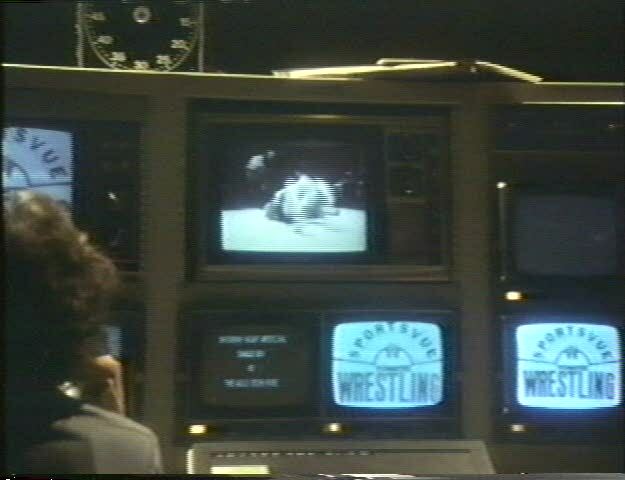 As Jim goes into training for the match Dan tells him that he will be fighting The Demon, a masked wrestler who Dan thinks could really be a vicious crippler named Kinski. 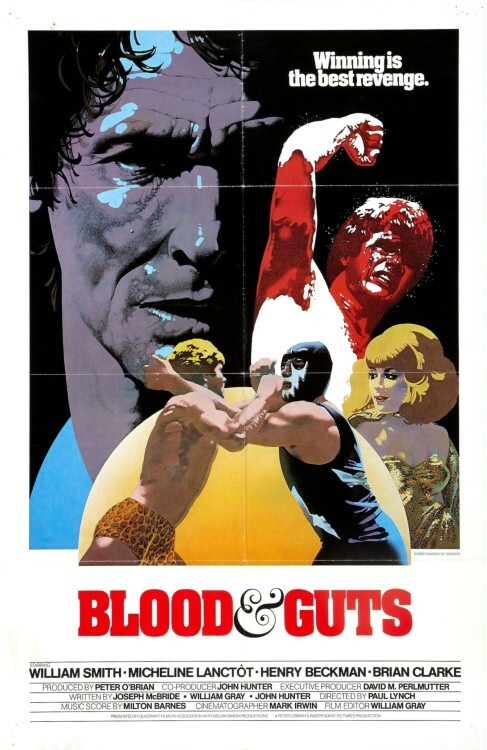 Although a better film than you might expect, Blood & Guts is often criticized for its lackluster wrestling. It's true that the matches don't stand up to the "in your face" pyrotechnics of today, or even the high flying Mexican wrestling films of the same era, but Blood & Guts has a gritty feel to it that captures the low-rent, maligned industry at a crucial time before legions of kids started referring to themselves as " Hulkamaniacs." For one thing, wrestling is acknowledged as "fake" from the beginning of the film, perhaps the first movie to treat professional wrestling as "sports entertainment." Secondly, there are no athletic stunt doubles here William Smith and the others do their own wrestling. To the WWE fan, Blood & Guts may not look like "real" wrestling, but in the context of the film, it comes off as "real" enough. But that's really besides the point anyways, since Blood & Guts isn't really a wrestling movie. Just as Lynch's first film The Hard Part Begins only uses country music as a backdrop for crooner Jim King's irresponsibility, Blood & Guts is really about the passing of the torch to the younger generation. The short-lived Canadian "loser" film trend of the 1970s included Don Shebib's Goin' Down the Road (1971), Peter Carter's The Rowdyman (1973), Peter Pearson's Paperback Hero (1973) and the aforementioned The Hard Part Begins (1974). Blood & Guts appeared extremely late in the cycle, but managed to incorporate enough conventions from its predecessors to become a fitting swan song for the toqued screw-up. There are immediate comparisons to Paperback Hero, in which Keir Dullea plays Rick, a character whose former glory as a sports hero has stunted him emotionally. Like Rick, (as well as Jim King in The Hard Part Begins) Dan inhabits a desolate landscape, is prone to bar fights, and can't move past his former glory. Worse, each of these characters is painfully aware that their best days are behind them only they continue drinking, womanizing and failing because they don't know how to cope otherwise. Blood & Guts differs in one important way, though. In the earlier "loser" films, the defeats suffered are never the end of the story we know that Pete and Joey will try their luck in Vancouver, that Gordon Pinsent's Will Cole will live to drain another pint. Not so with Dandy Dan O'Neil, whose road has ended now that his wrestling days are over. In the bittersweet final scene, Lynch allows this "Canadian loser" to bow out with a modicum of dignity. Although we don't know what happened when Pete, Joey and the others reached the end of their roads, it's the kind of ending that we would wish for all of them. Recognizing Dan for what he is proves a fitting end to this uniquely Canadian genre.